Kuiu Island is an island in the Alexander Archipelago in southeastern Alaska. It lies between Kupreanof Island, to its east, and Baranof Island, to its west. The island is 105 km (65 mi) long, and 10 to 23 km (6–14 miles) wide. It is nearly cut in two by Affleck Canal. It has 1,936.16 km2 (747.56 sq mi) of land area, making it the 15th largest island in the United States. The entire island is part of Tongass National Forest. The population was 10 persons at the 2000 census. It is separated from Baranof Island by Chatham Strait. The Cape Decision Light is located on Kuiu Island. Also on the island are the Kuiu Wilderness and the Tebenkof Bay Wilderness areas. The island was first charted by Joseph Whidbey and James Johnstone, two of George Vancouver's men during his 1791-95 expedition, in 1793-94. The latter, Johnstone, proved its insularity. Cape Decision is a lighthouse located on Kuiu Island. Barrerite from Rocky Pass, Kuiu Island. 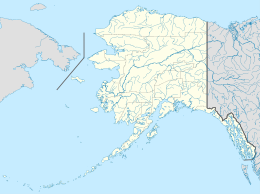 This article about a location in the Petersburg Borough, Alaska is a stub. You can help Wikipedia by expanding it.